I had heard of Richard Laymon for many years, yet somehow I've always managed to not read his work until about a year ago. I started with his first book, The Cellar, then read The Beast House. Flesh is my third Laymon novel, and it leaves me impressed. What I like about Flesh is the writing. There's no attempt at any flashy poetics. It's all very straight forward with little to no errors. Laymon was a writer who knew his strengths and limitations and wrote well within. I also love his characters, as they seem to breathe off the page, they're so real to me. What I don't like about Laymon, or at least what I noticed in Flesh, is the cheesy, '80s slasher film feel to it. Although Flesh was written during the mid 1980s, I feel the book would have gained much if perhaps the plot didn't feel quite so rushed, especially at the end. Perhaps Laymon was on a tight deadline schedule? Or was this another limitation? 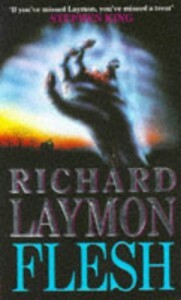 Whatever the case, Laymon is an author to check out. I highly recommend his novels on what I have read. As mentioned above, his style is simple, but it is a great breath of fresh air in a genre polluted with lukewarm writers who, perhaps, try too hard. But this is just one guy's opinion.